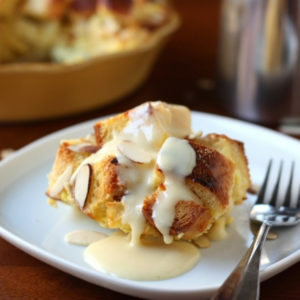 Rich almond flavored bread pudding topped with a warm eggnog sauce. An indulgent holiday treat! If any of you are under the impression that bread pudding is boring, dull, and something that you do not like, let me kindly tell you that you are wrong. And I beg you to let me change your mind. Sure, not all bread puddings are created equal and no one likes a bland soggy bowl of it. 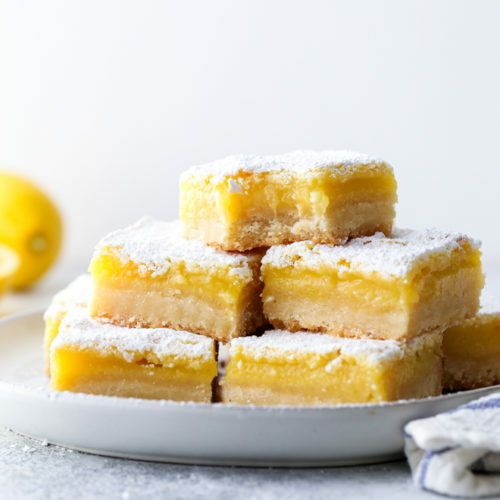 But when it’s done just right, with a crisp exterior and sponge-like custard interior, it’s magical. Bread pudding, in my opinion, is the macaroni and cheese of dessert. 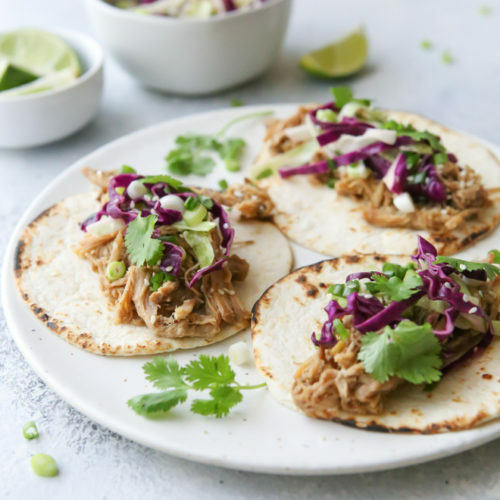 It’s homey, comforting, and extremely satisfying. And also quite indulgent. 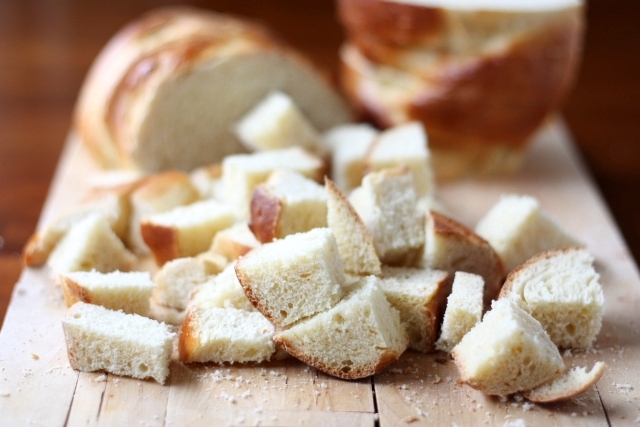 This is my favorite recipe, made with homemade challah bread and flavored with almonds. It’s perfect as is, but it’s also a great jumping off point if you want to add chocolate or fruit or whatever else strikes your fancy. A sauce is always necessary when serving bread pudding, and I love how it adds another layer of rich creaminess on top of the crisp crust of the bread. It just ties it all together into one tasty package. And since the holidays are upon us, I’ve topped this bread pudding with an eggnog sauce spiked with a little bit of brandy and almond flavoring. If you happen to have some amaretto (almond liquor) on hand, which I didn’t, it would be excellent in place of the brandy. 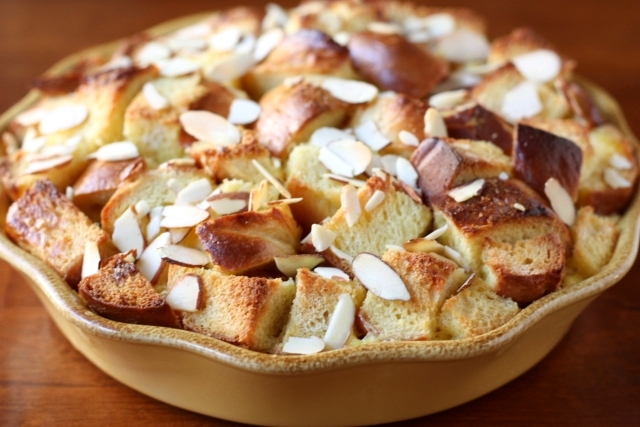 I can think of few desserts as perfect for serving after a holiday meal as bread pudding. It goes great with gathered loved ones, warm fires, and hot cocoa. 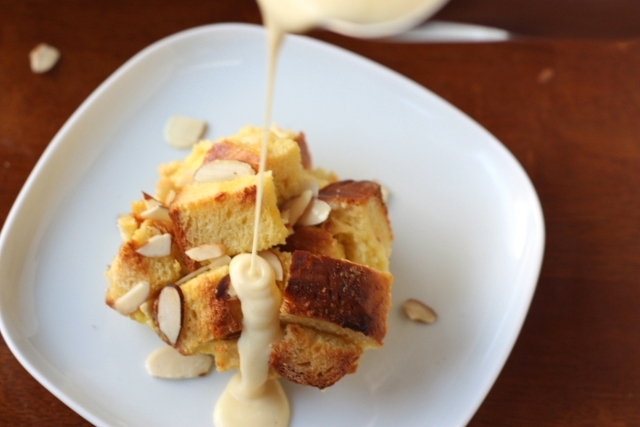 Rich bread pudding with an almond flavor custard and topped with a warm eggnog sauce. Preheat oven to 350 degrees F. Grease a 9-inch baking dish with butter or spray with nonstick cooking spray. 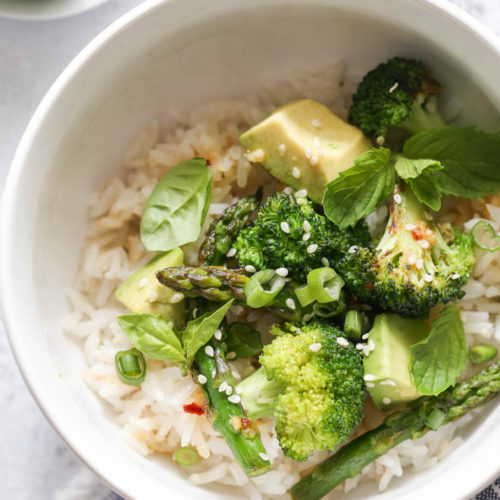 In a bowl, whisk together the egg yolks. In a small saucepan combine the heavy cream, milk and sugar. Place over medium heat and heat until bubbles appear at the edges and mixture is steaming, do not boil. Remove from heat and slowly pour into the egg yolks in a small steady stream, while whisking constantly. Add the almond extract. Put the cubed bread in the greased baking dish, packing it as tight as possible. 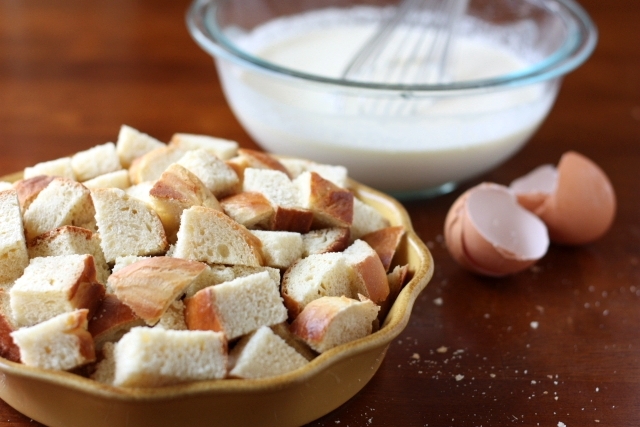 Pour the egg mixture over the bread cubes, making sure that none of the exposed cubes are left dry. Let sit for one hour, occasionally pressing down the cubes to make sure they are all absorbing the custard. Sprinkle with the sliced almonds. Bake until top is golden and crisp, about 30-35 minutes. Serve warm or cold with eggnog sauce (recipe below) and more almonds. Store bread pudding in the fridge for up to several days. Whisk all ingredients together in a small saucepan. Set over medium high heat and bring to a boil, stirring frequently. Boil for one minute until sauce has thickened, stirring constantly. Remove from heat. Serve warm or cold. Store in the fridge. Note: If possible use a sweetened enriched bread like challah or brioche for a richer pudding. Alternately, you can use any artisan baguette or loaf. I completely agree with you about bread pudding being comfort food. I had a wonderful eggnog bread pudding at a local restaurant that is famous for desserts and it is probably one of my favorite desserts I have ever had. This sounds very similar. The hard sauce is a must, too! Especially around the holidays. I have only recently discovered the joy of bread pudding – don’t know why it took me 55 years! 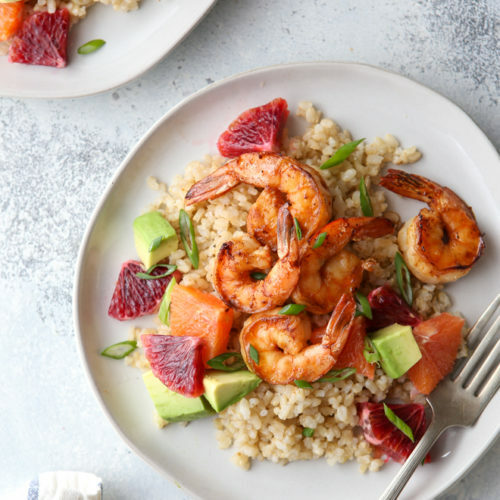 I will definitely give this recipe a try – thanks! 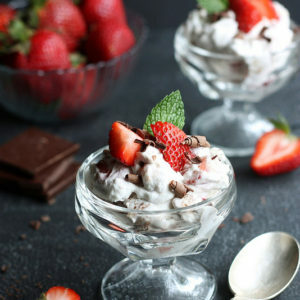 Makes me drool,would love to have rite now. 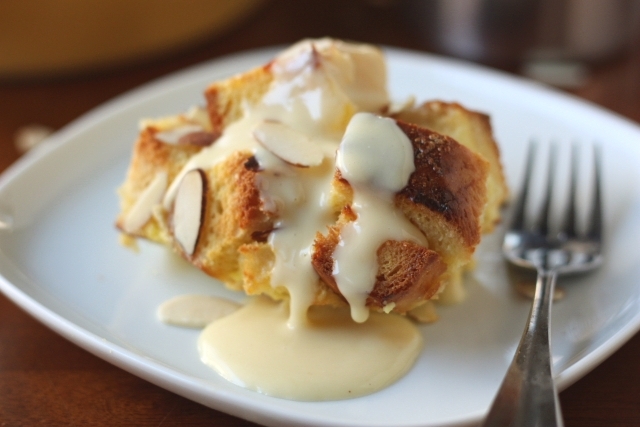 I love bread pudding — especially one with almonds and doused with eggnog sauce, whoa! 🙂 I make a panettone bread pudding with almonds and a dulce de leche sauce for the holidays but I’m loving how scrumptious your version looks. Have a great Christmas and New Year! 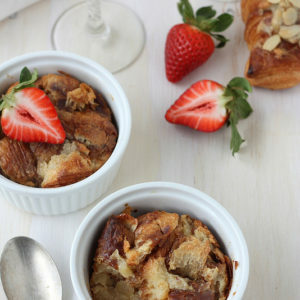 I’m a ginormous bread pudding lover and this looks incredibly delish. I love the combination you used, I haven’t seen it before and I can bet it tastes as good as it sounds! 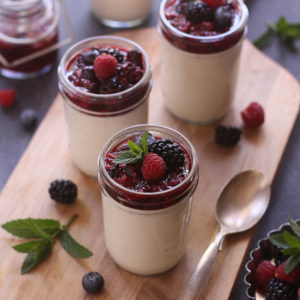 Lovely pictures, too 🙂 Pinned this recipe and glad to be your newest follower! GOODNESS this looks delicious. Bread pudding is my absolute favorite..and with eggnog sauce? Brilliant. This could change any bread pudding nay-sayer’s mind. Almonds, egg nog…yep you’ve got my attention. Happy Holidays to you, Annalise! 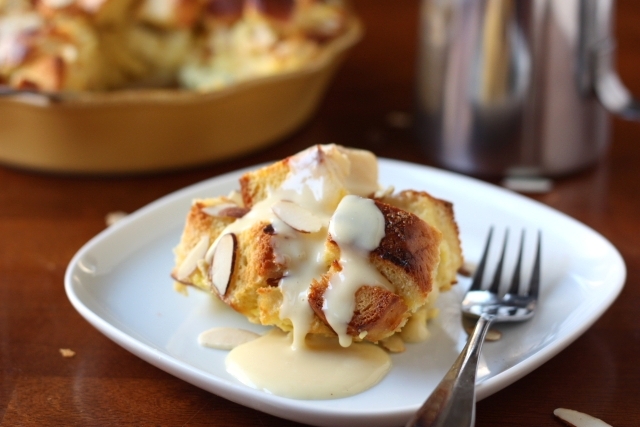 I love bread pudding, and love this eggnog twist! It looks so good,Ican almost taste it.Bread pudding is one of the older style desserts that is on my list.A little goes along ways ( to keep the calories down) my whole family loves it but I only fix it at special times. Thank for the recipe. I’m the same way! I don’t make bread pudding often, but it’s a must for the holidays!